GREEN BOARD BOOK REVIEW: Eco People on the Go! Teenie Greenies’ Eco People on the Go! is all about just that: people biking, walking, carpooling, and skateboarding. The story is easy enough for babies to enjoy hearing read aloud and then can be recycled into a first book for kids learning to read. With simple pictures to accompany the words and several lift-the-flaps (what tot doesn’t go crazy for lift-the-flaps? ), Eco People on the Go! might even inspire the most stationary baby to start crawling or walking. The book is printed with soy ink on 80% recycled paper and finished with a water-based varnish, making Eco People on the Go! a nice, affordable addition to any board book library. 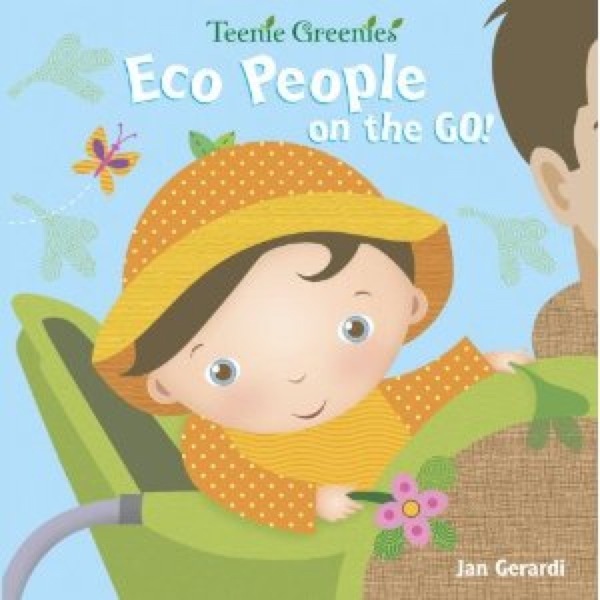 Teenie Greenies'�Eco People on the Go! is all about just that: people biking, walking, carpooling, and skateboarding. The story is easy enough for babies to enjoy hearing read aloud and then can be recycled into a first book for kids learning to read. With simple pictures to accompany the words and several lift-the-flaps (what tot doesn�t go crazy for lift-the-flaps? ), Eco People on the Go! might even inspire the most stationary baby to start crawling or walking. The book is printed with soy ink on 80% recycled paper and finished with a water-based varnish, making�Eco People on the Go! a nice, affordable addition to any board book library.